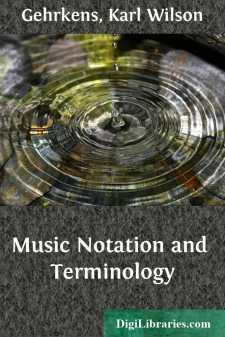 The study of music notation and terminology by classes in conservatories and in music departments of colleges and normal schools is a comparative innovation, one reason for the non-existence of such courses in the past being the lack of a suitable text-book, in which might be found in related groups clear and accurate definitions of the really essential terms. But with the constantly increasing interest in music study (both private and in the public schools), and with the present persistent demand that music teaching shall become more systematic and therefore more efficient in turning out a more intelligent class of pupils, it has become increasingly necessary to establish courses in which the prospective teacher of music (after having had considerable experience with music itself) might acquire a concise and accurate knowledge of a fairly large number of terms, most of which he has probably already encountered as a student, and many of which he knows the general meaning of, but none of which he perhaps knows accurately enough to enable him to impart his knowledge clearly and economically to others. To meet the need of a text-book for this purpose in his own classes the author has been for several years gathering material from all available sources, and it is hoped that the arrangement of this material in related groups as here presented will serve to give the student not only some insight into the present meaning of a goodly number of terms, but will also enable him to see more clearly why certain terms have the meaning which at present attaches to them. To this latter end the derivations of many of the terms are given in connection with their definition. The aim has not been to present an exhaustive list, and the selection of terms has of course been influenced largely by the author's own individual experience, hence many teachers will probably feel that important terms have been omitted that should have been included. For this state of affairs no apology is offered except that it would probably be impossible to write a book on this subject which would satisfy everyone in either the selection or actual definition of terms.